Tax Foundation economists used the Taxes and Growth Model to estimate the growth and revenue effects of the Rubio-Lee plan. We did not model the proposal’s transition provisions. The plan would boost investment by nearly 49 percent, wages by 12.5 percent, and raise the level of employment by nearly 2.7 million jobs. The plan would increase federal revenue on a dynamic basis by an annual $94 billion in the long run, following an estimated $1.7 trillion revenue loss over the initial ten year period. On a static basis, the plan would cost $414 billion annually. The plan would have widely shared benefits, with low-income earners receiving a large boost to their after-tax incomes. The plan’s main drivers of growth are the lower cost of investment—from full expensing, corporate integration, and lower tax rate on businesses—and the increased incentive to work—from the lower rates on personal income. Senators Marco Rubio (R-FL) and Mike Lee (R-UT) have developed a plan to reform the individual and corporate income tax codes. The plan’s headline feature is an additional child credit to reduce the tax burden on families with children. But of great importance to the overall economy, the plan’s chief economic thrust is its attempt to eliminate many of the income tax system’s biases against saving and investment. If the pro-growth provisions work as intended, they could lead to a more competitive U.S. economy, with better jobs and higher incomes. We used the Tax Foundation’s Taxes and Growth Model to estimate the growth and revenue effects of the Rubio-Lee plan. The results indicate that the plan would generate a large and positive impact on growth. Measured by the rise in economic activity, the Rubio-Lee proposal qualifies as genuine tax reform. However, its tax changes would also create a large financing need during the first several years. The next section summarizes the main elements of the Rubio-Lee draft proposal. The model’s estimates of the economic and revenue effects follow. The Rubio-Lee plan has many components. It may be helpful to think of the plan as being divided into three main segments. First, Senators Rubio and Lee believe that the tax code should better reflect the costs of raising children. They would add an additional tax credit for that purpose. Second, they are aware that the individual and corporate income taxes are strongly biased against saving, investment, and business activity. For example, the United States has the highest statutory corporate tax rate of any developed nation, one of the highest effective corporate tax rates, and is one of the few nations that taxes its companies on their worldwide income rather than just their income generated at home. The Rubio-Lee plan includes a number of provisions that reduce these biases or, in some cases, eliminate them. Third, the plan includes many provisions that the senators hope will simplify the income tax’s structure. The plan would establish an additional child tax credit of $2,500. It could be used to offset income and social security taxes (employee and employer shares). Unlike the current child credit—which would remain in place—the additional credit would not phase out with rising income. Senators Rubio and Lee are concerned that many features of the individual and corporate income taxes penalize saving and investment, thereby slowing the U.S. economy and reducing its competitiveness compared to other nations’ economies. They seek to lower or remove those barriers. The plan would cut the corporate tax rate to 25 percent. It would cap the tax rate on noncorporate business income at 25 percent. The plan would allow corporate and noncorporate businesses to expense (write off immediately) their investments in equipment, plant, intellectual property, inventory, and land, creating a “cash flow” tax that fully accounts for all the costs of business investment. The proposal would integrate the corporate and shareholder taxes to remove double-taxation, which we have modeled as a zero tax rate on qualifying capital gains and dividends. The proposal would repeal many of the tax increases in the Affordable Care Act, including its surtaxes on upper-income individuals’ wage and investment income. The plan would end most business tax credits and many special deductions. Several of the draft proposal’s recommendations would simplify the individual tax code. The plan would eliminate the head of household filing status. The proposal would reduce the number of rate brackets to two: 15 percent and 35 percent. The 35 percent bracket would begin at a taxable income of $150,000 for joint filers and $75,000 for individual filers. The senators chose a threshold twice as high for joint filers as for others to avoid a marriage penalty. All itemized deductions would be eliminated, except for the charitable and mortgage interest deductions. The mortgage interest deduction would be slightly trimmed for large mortgages. The plan would abolish the individual alternative minimum tax, which now hits several million middle- and upper-income taxpayers. The proposal would flip the current treatment of interest. Interest costs would become nondeductible but interest receipts would not be taxed. This is the treatment under a standard cash-flow tax. It would massively simplify the tax system because lenders and borrowers would no longer have to track interest payments and receipts on their tax returns, nor would tax authorities have to keep track. (An exception noted earlier is that mortgage interest would still be tax deductible.) It would also eliminate a major source of tax planning, thus shifting resources to more productive activities. It increases revenue by taxing returns on investments that might otherwise flow untaxed to tax-exempt or foreign entities. For the interest flip and some other provisions, the plan contains transition rules intended to make the changes prospective and prevent them from being retroactive. To reduce the proposal’s short-term revenue cost, the plan would require U.S. companies to pay a 6 percent tax on earnings held abroad by their foreign subsidies. Under current law, the United States defers tax on those earnings until foreign subsidiaries pay (repatriate) the money to their U.S. parents. This deemed repatriation provision would clearly be a retroactive tax. Moreover, although the proposed tax rate is not high, the unexpected tax liability would be large because the unrepatriated earnings of foreign subsidiaries are large. On the other hand, the reward for accepting this pay-for would be genuine, long-term business tax reform. We modeled the provisions outlined above with four main exceptions. We did not estimate the effects of territorial taxation on international competitiveness and tax simplification. We estimated the effects of repealing the Affordable Care Act’s surtaxes on wage and investment income, but not the impact of eliminating other new taxes in that legislation. The model did not evaluate the impact of the plan’s simplification provisions on taxpayers’ paperwork costs. The model also did not estimate the cost of the transition to the new system, the deemed repatriation provision that would help finance the transition, or the efforts of many transition rules to smooth the adjustment. These gains would not occur overnight. The model is long run, and the economy would require several years to adjust. However, while the gains would not be instantaneous, they would take place fairly quickly. Based on rates of capital replacement, most of the adjustment for equipment would probably occur within five years, and most of the adjustment for structures would likely happen within ten years. Chart 1 offers an illustrative adjustment path for GDP. The baseline is the Congressional Budget Office’s current-law projection of GDP growth over the next decade (with 2015 set at 100). The higher line represents the Rubio-Lee proposal. It is drawn under the illustrative assumption that the plan’s improved incentives for work, saving, and investment would lift GDP growth by an extra 1.44 percent each year during the next decade. At the end of the tenth year, GDP would be 15 percent above the CBO baseline. 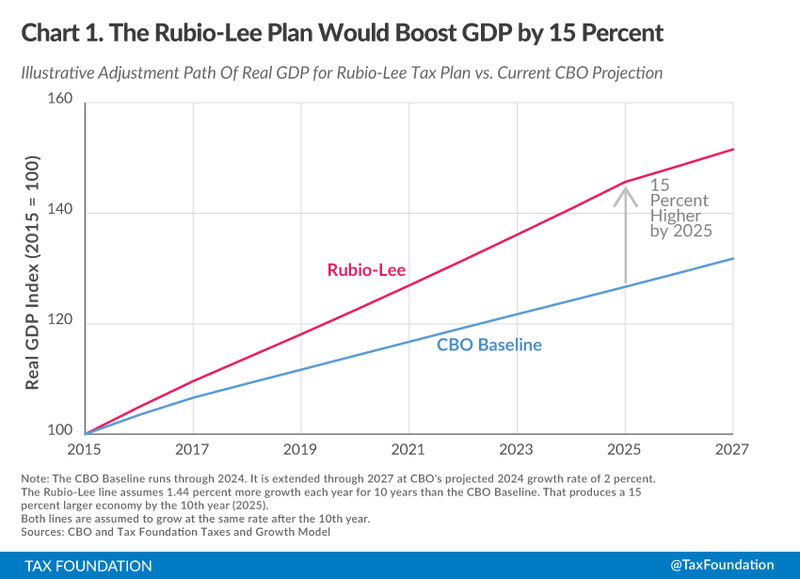 Thereafter, the growth spurt would level off, and the two growth lines would move in parallel, with GDP under Rubio-Lee continuing to be 15 percent higher than under current law. The plan’s impact on government revenue, though, would be substantial. In a conventional revenue estimate that ignores the growth effects of tax changes (often called a “static” revenue estimate), the plan appears to lower federal revenue by about $414 billion annually. In a dynamic revenue estimate that accounts for tax-induced changes in economic activity, the budget would improve over time. 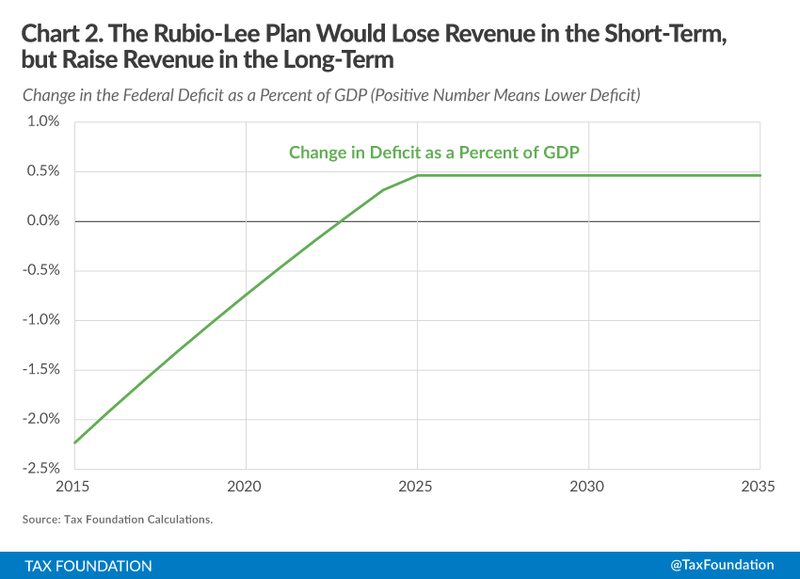 The Rubio-Lee plan would grow the economy, and the size of the economic pie is a major determinant of tax collections. In fact, some of the changes are so strongly pro-growth (notably expensing of capital investments, the zero tax rate on qualifying capital gains and dividends, and the much lower corporate tax rate) that the model predicts the plan would increase federal revenue by over $90 billion annually in the long run. 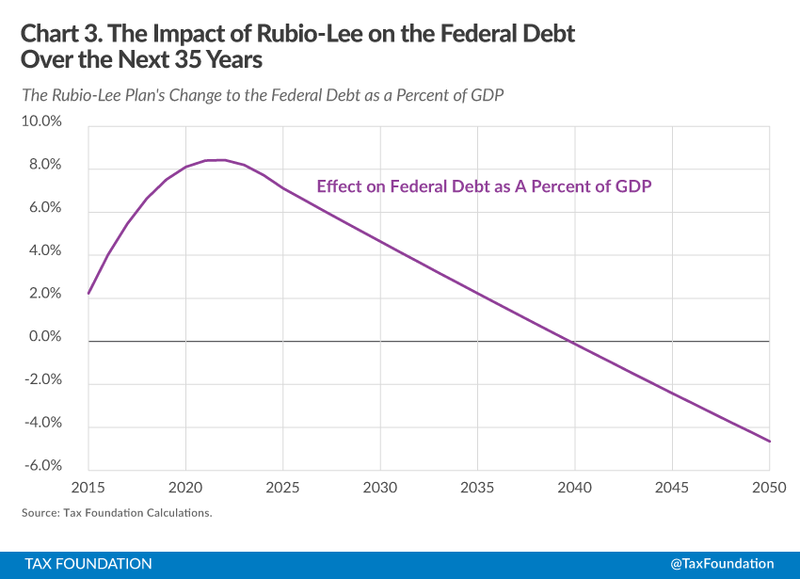 Charts 2 and 3 present illustrative time paths for the plan’s impact over time on the federal government’s budget deficit and cumulative debt. Both the deficit and debt are shown relative to GDP. The plan increases the budget deficit for most of the budget window, but it reduces the deficit by the end of the decade due to the positive revenue feedback from much stronger economic growth. If the revenue cost in the early years is not offset elsewhere in the budget, it would add to government debt. The deficits’ cumulative effect on government debt would be significant, and the impact would be increased because of the interest cost of servicing the extra debt. In the illustrative example in Chart 3, the addition to debt is largest by the end of the decade; after that, the yearly surpluses gradually whittle down the debt. For added perspective, Table 2 provides growth and revenue estimates for several components of the draft proposal, assuming no other changes. **This models full expensing of equipment, residential structures, and nonresidential structures. It does not model expensing of inventories and land. The plan would create individual income tax rate brackets of 15 and 35 percent, with the higher bracket beginning at $150,000 for joint filers and $75,000 for singles. Column A in Table 2 shows the model’s estimates of the economic and revenue effects of condensing the individual income tax’s rate structure into two brackets, 15 and 35 percent (capped at 25 percent for business income), and eliminating the marriage penalty now in the upper bracket structure. The dominant force here is the very large number of taxpayers in the current 25 percent bracket who would receive a 10 percentage point rate cut. Taxpayers in the 39.6 percent bracket would also experience a rate cut, while those in the 10 percent bracket and some in higher brackets would see the tax rate on their last dollar of income increase. With marginal tax rates falling on net, the model estimates that the capital stock would rise 1.3 percent, private-sector hours worked would increase 0.9 percent (the equivalent of 888,000 full time jobs), and, with more capital and labor being supplied in production, GDP would be 0.9 percent higher than otherwise. The simplified rate structure would have an estimated static cost of $31 billion but, because of income growth, would be about revenue neutral on a dynamic basis. Column B reports the estimated impact of letting businesses expense all of their investment costs—that is, permitting the businesses to deduct investment expenses when they occur. Although immediate deductibility is the normal treatment with labor costs, businesses must usually write off their investment costs over several years, sometimes over several decades. Because a dollar in the future is worth less than a dollar today due to inflation and the time value of money, stretched-out depreciation deductions understate costs in present value terms. For instance, current-law depreciation deductions on many structures have a present discounted value of only about 50 cents on the dollar. Because people’s willingness to invest is extremely sensitive to after-tax returns, stretched out depreciation schedules severely depress capital formation. Full expensing would correct that. The model predicts that with full expensing the capital stock would climb 15.5 percent, the wage rate would rise 4.4 percent, employment would grow 0.8 percent (the equivalent of 778,000 full time jobs), and GDP would be 5.1 percent higher than otherwise. A conventional revenue estimate would score this as costing $78 billion annually, but the model’s dynamic estimate is that it would raise over $115 billion a year due to economic growth. Most other nations have concluded that high corporate tax rates are counterproductive. The Rubio-Lee proposal would bring the United States into line with the average rate in other developed countries. For symmetry, Rubio-Lee would apply the same 25 percent rate to noncorporate businesses. The zero tax rate on capital gains and dividends is also designed to moderate the income tax system’s bias against saving and investment, and treat all forms of business alike. The argument for the zero rate is especially strong for capital gains and dividends on corporate equity because the returns there come from earnings that were already taxed at the corporate level. As indicated in Column C, the model predicts this set of changes would cause the capital stock to expand by 30.2 percent, the wage rate to increase a robust 8.2 percent, employment to rise by the equivalent of 1.6 million full time jobs, and GDP to grow 9.6 percent. While a static revenue estimate pegs the annual cost of these changes at $210 billion, a dynamic estimate indicates they would boost federal revenue by about $170 billion a year. Senators Rubio and Lee view an additional child tax credit as a matter of fairness and a constructive way for the government to support families. The Taxes and Growth Model is not able to quantify these social policy benefits. The model does estimate that the credit would have almost no impact on economic growth (Column D). The credit would be expensive, with a predicted federal revenue cost of about $170 billion in a static estimate and almost the same on a dynamic basis. The credit could be made much less expensive if it phased out with rising income, but that would be a case of penny wise and pound foolish. In addition to being complicated, a phase-out would create a potentially large marginal tax rate spike. The rate spike would worsen economic incentives within the phase-out zone, which would slow growth and take away much of the revenue the phase-out would supposedly collect. 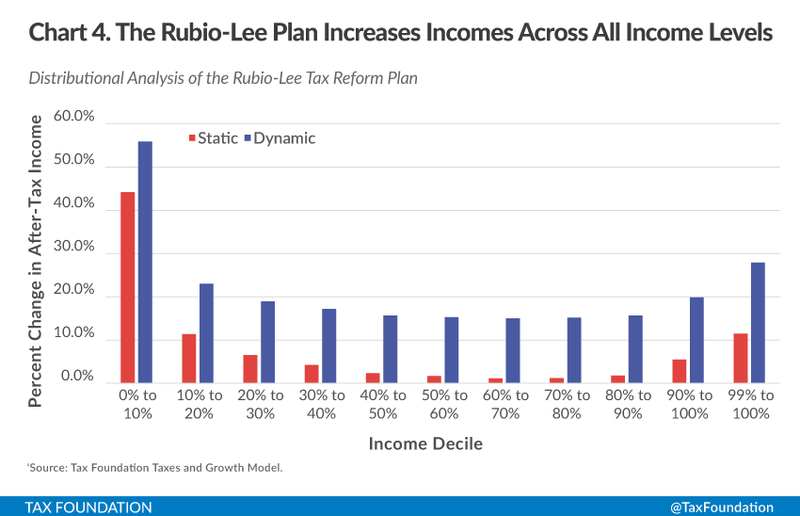 Using the Taxes and Growth model, we also estimated the distributional impact of the Rubio-Lee proposal. Chart 4 and Table 3 provide static and dynamic estimates of how the plan would change the distribution of after-tax incomes. The dynamic column displays a much different picture. The economic growth enabled by the plan would benefit all income groups. Although the distribution of gains would not be precisely equal, they should be more than large enough to satisfy people at all levels of income. For example, the after-tax income increases would be 17.8 percent on average, 23 percent for the 10-20 percent decile, 27.9 percent for the highest 1 percent, and 15.3 percent for the 50-60 percent decile. Senators Rubio and Lee have constructed a comprehensive tax plan that combines a number of solidly pro-growth reforms with a major social policy provision. If enacted, we estimate it would deliver strong growth for many years. Further, it would significantly raise the incomes of the poor, rich, and middle class. The plan, however, would substantially increase the federal government’s deficit during the budget window. By the end of the budget window or slightly later, though, we estimate that the reforms would have generated so much extra growth that federal revenues would be higher than under current law, and its budget deficit smaller. Mike Lee and Marco Rubio, Economic Growth and Family Fairness Tax Reform Plan, Office of Senator Mike Lee and Office of Senator Marco Rubio (Mar. 2015), http://www.rubio.senate.gov/public/index.cfm/files/serve/?File_id=2d839ff1-f995-427a-86e9-267365609942. 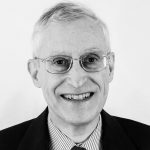 and Scott A. Hodge, Ten Reasons the U.S. Should Move to a Territorial System of Taxing Foreign Earnings, Tax Foundation Special Report No. 191 (May 11, 2011), https://taxfoundation.org/article/ten-reasons-us-should-move-territorial-system-taxing-foreign-earnings. be smaller. It should be mentioned that each dollar of the tax credit would be worth several dollars of exemptions and deductions. For example, if the tax rate is 15 percent, a $1,500 tax credit would produce the same tax saving as a $10,000 deduction. tax rate abroad, so foreign tax credits make the repatriation tax in that case relatively small. years in equal, $20 billion installments. Over the first 10 years, the deficits along the illustrative path total about $1.7 trillion before considering interest costs and about $2.3 trillion when interest costs are added. We modeled full expensing for equipment and structures. The Rubio-Lee tax plan would also allow full expensing for inventory and land. Tax Notes 980-987 (Mar. 3, 2014).